COQUITO—LIKE EGGNOG, ONLY BETTER | Jane Lear. Writing on Food and Travel. Around this time last year at a holiday lunch, our friend Elaine Greenstein, an art teacher and author-illustrator of children’s books, gave us a beautifully wrapped but decidedly knobbly present. Intriguing. The parcel was both heavy and cold. When held up to an ear and shaken cautiously, it sloshed. I freed the object from tissue and ribbon, then lifted it to the light. “What is it—eggnog?” I asked. I tried to sound surprised, but in a good way. The cream-based drink, which has its roots in an English posset, is usually too rich and too sweet for me; I’m more of a milk punch kind of gal. Elaine has always had my number. “I know you’re thinking yuck,” she said. “But this tastes great. It’s coquito, a Puerto Rican drink. It’s wonderful. And a little addictive.” She leaned back in her chair and beamed. A few years back, a neighbor gave a bottle of the homemade libation to Elaine and her husband for the holidays. The following December, Elaine found a recipe online, whipped up a batch, and returned the favor. Now her neighbor brings white rum back from his visits home to Puerto Rico for Elaine’s annual effort. Brilliant. Unlike many eggnog recipes, coquito doesn’t contain whipped cream or beaten egg whites to lighten. Instead, it has an unabashedly heavy, satiny texture. 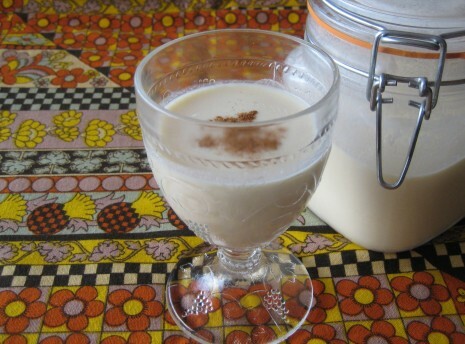 There are many versions of coquito; in this one, evaporated milk gives it a slightly caramelized, dulce de leche kind of vibe, and cream of coconut puts it over the top. Like last week’s lobster stew or—more to the point—an aged eggnog, coquito shouldn’t be rushed; it needs time to collect itself in the refrigerator for up to a week. Boil 2½ cups of water with 2 cinnamon sticks and 4 whole cloves. Take the spices out when the water turns yellow. Lower the heat. Add 1 can of evaporated milk and 1 can of sweetened condensed milk and bring to a simmer. Next, beat 3 egg yolks and add to the mix. Cook, stirring, until the mixture is thickened and coats the back of a spoon. Pour the mixture through a fine sieve into a bowl. Stir in 1 can cream of coconut and 2 cups white rum. When coquito is cool, transfer to an airtight container and refrigerate until cold, at least a few hours and up to a week, if you can stand it. Serve it straight up or on the rocks. For fun, sprinkle it with freshly grated nutmeg or a smidgen of toasted coconut.